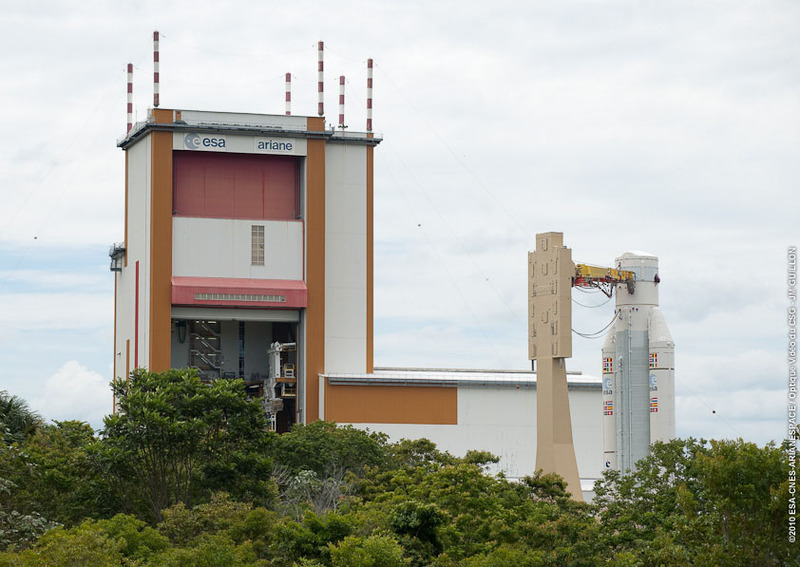 The Ariane 5 for Arianespace’s fifth heavy-lift mission of 2010 has moved to the Final Assembly Building at the Spaceport in French Guiana, where it will be fitted with a dual-passenger payload of the Intelsat 17 and HYLAS 1 satellites. This milestone marks Ariane 5’s formal delivery to Arianespace by industrial prime contractor EADS Astrium Space Transportation, which was responsible for build-up of the launch vehicle’s core cryogenic stage with its two solid boosters and the cryogenic upper stage in the Spaceport’s Launcher Integration Building. The Ariane 5 for Arianespace’s November 25 mission approaches its Launcher Integration Building at the Spaceport. The Ariane 5’s liftoff with Intelsat 17 and HYLAS 1 is set for November 25, and will be the 198th mission of an Ariane family launcher. Once in orbit, Intelsat 17 will offer distribution in a region that extends across Asia and into Europe and Africa, operating from an orbital positioned of 66 deg. East – effectively located next to Intelsat’s successful Asian video distribution neighborhood positioned at 68.5 degrees East. The spacecraft was built by Space Systems/Loral, and carries C- and Ku-band capacity to provide multi-continental coverage. It is to replace the Intelsat 702 satellite, which was launched by Arianespace in June 1994. HYLAS 1 will bring high-speed broadband services to remote rural areas across Europe using a highly adaptable Ku- and Ka-band payload. Designed and built by EADS Astrium for satellite broadband operator Avanti Communications, this spacecraft is designed to allocate varying amounts of power and bandwidth to the various regions within its footprint, reacting to the highs and lows of traffic demand.